Two years ago when I came to Cozumel there was a sign outside of Mezcalito’s that said “Cheeseburger in Paradise”, I’m gonna go out on a limb here and assume in reference to the Jimmy Buffet song. There is now a Jimmy Buffet restaurant in Cozumel and the sign is gone from Mezcalito’s so make of that what you will. It’s located right on the beach and is decorated with t-shirts all over the ceiling (there isn’t much wall space since it’s open air) and signs. It’s a very relaxed environment here and I could envision most folks spending an entire afternoon here enjoying the view, breeze, food, and drinks. I’m looking over their fancy laminated menu and read the proclamation “Everything is Delicious!!”. Really? In that case, I’ll have the Gilligan Cheeseburger. The menu doesn’t have that name on it but the bartender referred to it as such, unless that was some sort of code word, hmmm… And to wash it down? A Mexican Coke, except here it’s just a Coke. 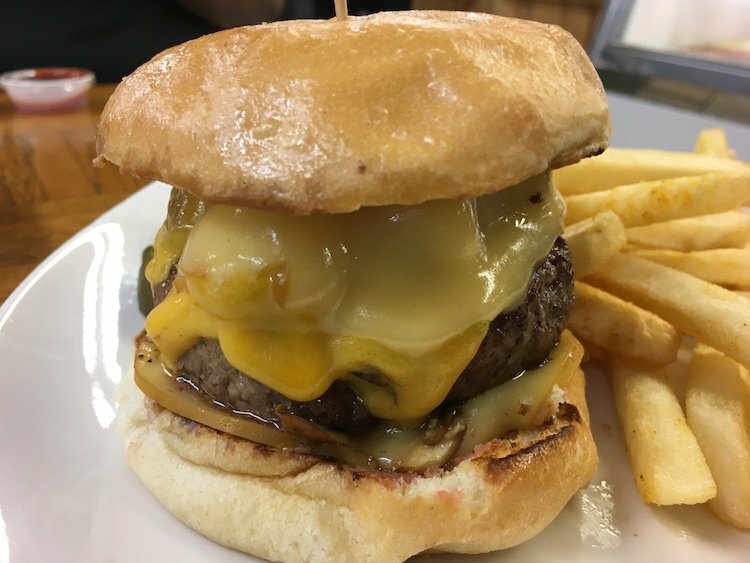 The Cheeseburger comes topped with Manchego Cheese. If you’re a Cheese fan and you’ve never encountered Manchego Cheese I would suggest you seek it out. It’s made from sheep’s milk, is creamy and pungent (in the good way). The Burger was nicely seared and retained it’s moistness even though it was cooked a little more than I would have liked. The Bun was toasted which of course is a good thing. This guy was about half a pound of deliciousness. The fries were just the regular stuff you’d expect to get anywhere, and no, I didn’t eat the Lettuce, Tomato, and Onion. If you’re looking for the non-touristy area of Cozumel to just sit back, relax and enjoy the breeze then this is the place for you. Just a reminder, the menu says “Everything is Delicious! !” (I can confirm the burger is), time for you to try the tacos!